HOW DOES THE KDJ INDICATOR WORK? In accordance with the name of the indicator, KDJ indicator consists of 3 lines (K, DJ) and 2 levels (overbought and oversold). The K and D lines are the same lines as the lines on the Stochastic Oscillator indicator. And line J is the difference from the value of D and K.
Conversion from the line will indicate a signal or opportunity to open an open trading position. Same as in the Stochastic Oscillator indicator, there are oversold levels and overbought levels according to the time when trend movements tend to reverse or reversal. By default these levels are set at 20% and 80%, but you can still change or adjust according to your wishes. 3. The most important indicator line color is to remember the J line color, because this J line will be used as a benchmark. In this tutorial I change the J line color to Blue. HOW DO I TRADING AND READING SIGNALS USING KDJ INDICATORS? Usually for trading binary options with an expiration time of about 1 minute, I use a 15 second candlestick time interval and a 15 minute time frame and 5 minutes to do the analysis.For trading with another period of time, please experiment to adjust to your trading style.For more optimal analysis results it is recommended to be combined with other indicators such as ADX indicators and ATR indicators. So that it can provide a more optimal signal about the reversal of future trends and be able to determine market volatility because the KDJ indicator does not work on market movements that are sideways or flat. Please note that none of the indicators can provide 100% accurate signals from time to time. Even the best. Therefore, don't forget to follow risk management and capital allocation.Hopefully the trading strategy tutorial using this KDJ indicator is useful for you in achieving profit consistently. 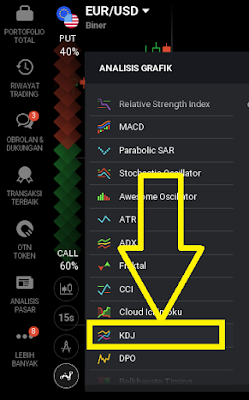 0 Response to "Binary and Forex Trading Strategies Using KDJ Indicators"